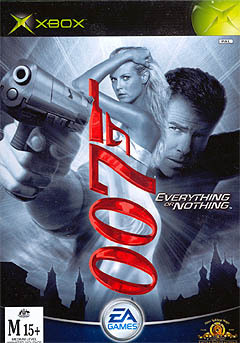 The music starts and immediately you are hooked: guns, money, weapons and hot chicks have been a formula for Bond for so many years now and it still proves a winner every time, even with female consumers. James Bond, the world's greatest secret agent is here is electronic glory for Electronic Arts in this very successful title based on a story designed specifically for the game. 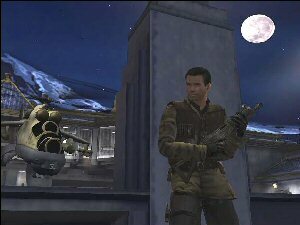 This is not a two bit affair ladies and gentlemen and all the big guns have been pulled out in order to make this game worthy of being added to the Bond storyline with voice actors being pulled directly from Hollywood with Pierce Brosnan voicing Bond and a bevy of other name actors doing an excellent job on bringing this great game to life. Other actors bringing their characters to life are Judi Dench as M, John Cleese as Q, Shannon Elizabeth and Heidi Klum as Bond girls, and Willem Dafoe as Nicolai Diavolo, our main bad guy for this particular tale. You can tell from this effort alone that this Bond game is going to be something special and the whole game is a standout stellar effort. The first thing that you will notice is that this game is in the third person and the level of detail that assaults you in amazing, making this quite possibly the best looking Bond game to date as well. All the gadgets are here again happily supplied by Q, however gone are some of the really corny soundbites that took a lot of the seriousness out of the previous titles and affected the way in which you took the game. There was nothing worse than getting right into what you would take to be a serious game and a serious situation and then an inappropriate comment would wreck it all for you. Well folks, that doesn't happen here. What does happen is an amazing adventure that will take you all over the world and traveling by more than one mean of transportation such as tanks, cars, bikes, and helicopters. The level of realism carries through to each vehicle with each having a certain feel to the way that they handle. Even the story in this game is written by Bruce Feirstein who was behind Goldeneye, Tomorrow Never Dies and The World is not Enough. Having a proper writer working on this title means that the plot is a lot more cohesive that previous efforts and actually helps with the feeling that you are part of something much greater than just a game. One of the really cool things about this game other than almost everything is the fact that there is a new feature in this one that newcomers will see as being very similar to bullet time as used in other games. This feature however doesn't allow for the 'easy cheat' provided by bullet time, however it does give Bond the chance to have a bit of a look around and change weapons if he needs to. It's an innovation that I really enjoyed and think that most other gamers out there will agree with me on this one. Adding to this impressive list of good things, this game also uses the Need for Speed engine to carry out the driving components of the game. Driving is a pleasure as you could expect and the feeling of acceleration is tangible. Complementing the games engine is the fact that there is more than one way to the top of the mountain so to speak which does remove the feeling of driving on rails somewhat as has been a problem with some other Bond games when you get behind the wheel/controls etc. This game has a perfect sense of balance and pacing when it goes from one mode to the other, with no sense of two games being tacked together in hopes that it works. Completionists will be inspired to play their way through this one as a good rating at the end will unlock a bevy of extras and even more weapons that you can take advantage of. Rounding out the stable are a swath of multiplayer options that essentially make this title a must have purchase for not only fans of the Bond games but just fans of good games in general. An area that I loved in particular was the cooperative aspect of multiplayer where you can work together to make your way through a level. Other games involve Scramble where you get points for achieving goals and losing them for failing. There is also Arena mode where there is a knockout type of arrangement for players to work their way through. Add to that a deathmatch and whatever rules you choose to make up on the server and you are guaranteed a hit. Finally rounding out this review is the audio with a brilliant 5.1 or THX mix that certifies this as a hit with all the audiophiles out there. Singer Mya does the theme song as well as being the voice for Agent Starling which does full justice to the Bond name and really gets you into the spirit of things. Other in game sounds are treated with the same amount of care and respect as the theme which makes this the most immersive Bond title I have seen in a long time. Do yourself a favour and get this game, you won't be disappointed.